Forsythia flowers give us one of the first splashes of color in early spring gardens. But to get that color and a well shaped shrub, it’s important to trim forsythia bushes correctly. Pruning forsythia requires some basic knowledge of how the plant is meant to grow. Seeing the cheery yellow blooms on the long arching stalks of a perennial forsythia shrub is one thing that always gets gardeners impatient for the warm weather to arrive so that they can start gardening again. Unfortunately, many gardeners make mistakes at planting time that makes it difficult to manage a forsythia shrub later. If your forsythia is outgrowing its spot in your garden, you can move it. 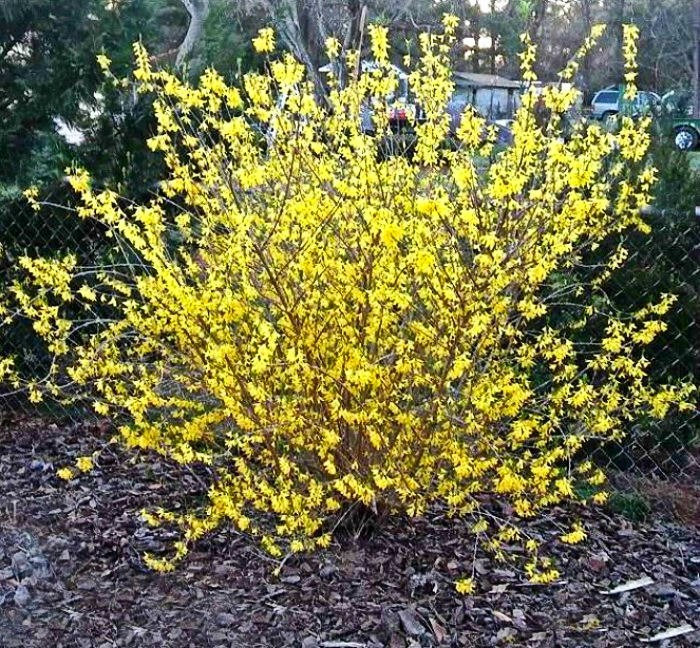 See my tips for transplanting forsythia here. If you don’t know when to get your forsythia shrub into the ground outdoors, see my tips for planting forsythia here. If you don’t know how to trim forsythia bushes, you aren’t alone. The flowers of the perennial come before the leaves. That fact alone makes pruning forsythia a challenge, since it goes brings up all sorts of questions about how and when to trim forsythia bushes! 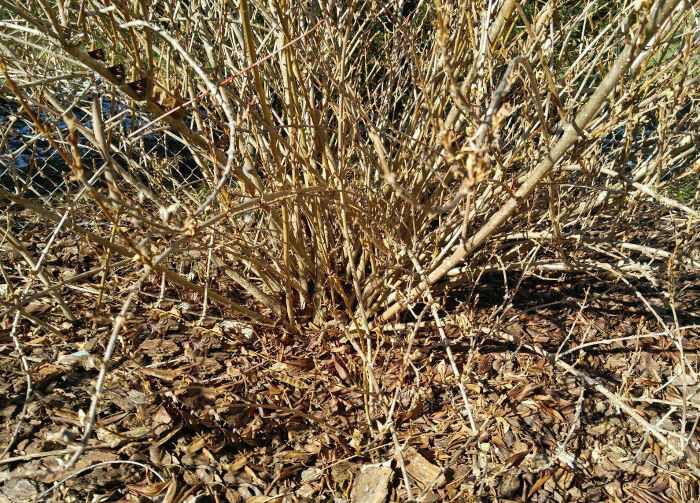 Overgrown forsythia bushes can get so large that normal pruning like this article mentions won’t do the job of managing them. In this case, it is time for either renovation pruning or hard pruning. See my tips for this process here. It’s easy to get off on the wrong foot with forsythia. After all, you want to look out the window in early spring and see those beautiful yellow flowers. So, planting the shrub right under your kitchen window or near your front entryway seems like the perfect spot, right? Think again! 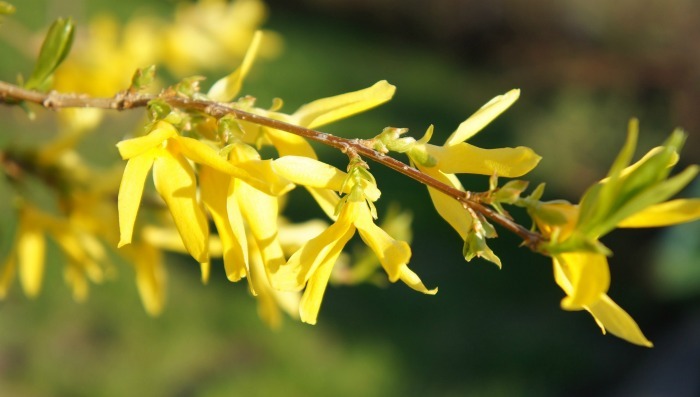 Before you start the job of pruning forsythia, make sure that you get it off to a good start! 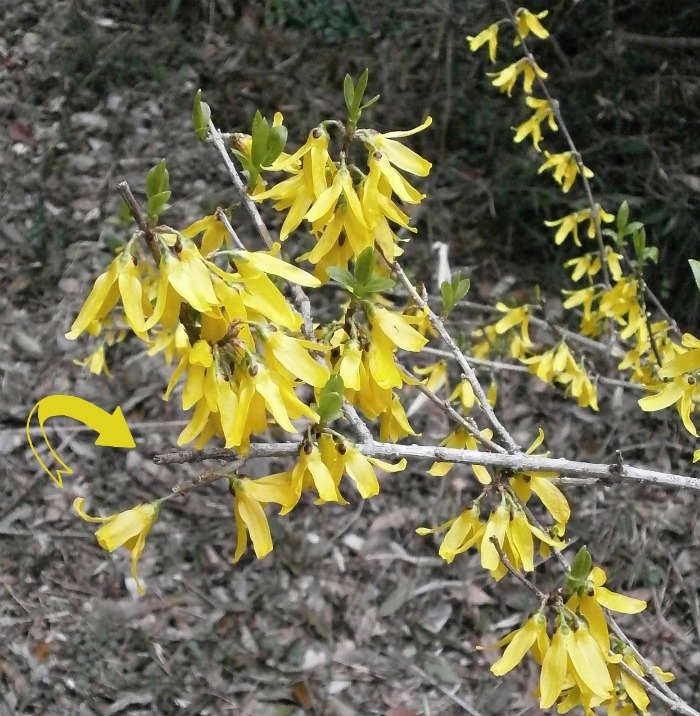 A forsythia bush has a graceful arching habit. The plants can grow seven to ten feet tall and just as wide. If you plant it in a small garden bed that is only a few feet wide, no amount of pruning will give you a good looking plant later. Many people complain that forsythia becomes an unruly plant as it grows but if you plant it with its eventual size in mind it can be a lovely focal point in your garden. Since the plant is meant to have arching branches, you can’t just snip branches off at the height and width that you are looking for. Each branch will send out moire branches at the snipped tips and you’ll end up with a weird looking ball or square shaped shrub. Sure, the plant will fit in your desired spot okay but you will have lost the shape of the forsythia bush that is just as important as those pretty flowers. 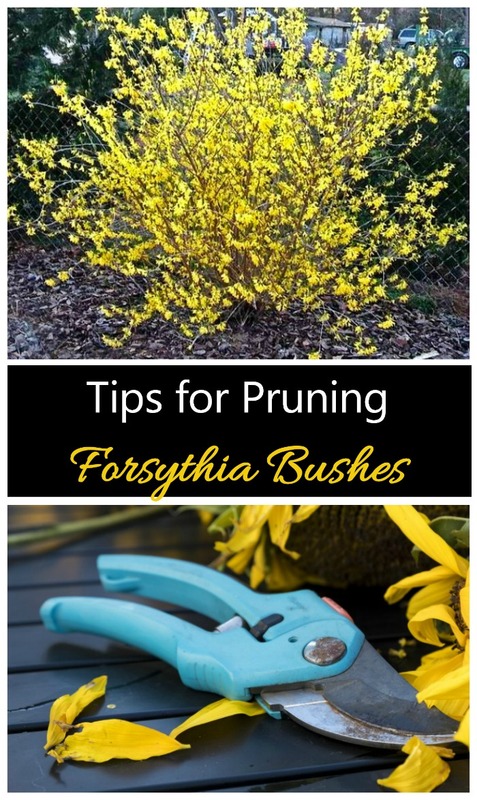 Tips for Pruning Forsythia bushes. Keep these size and growth habits in mind when planting and then you’ll be ready to trim forsythia bushes when the time is right. The very best way to get a nicely shaped bush is to make sure to give the plant lots of room to spread as it grows. The job also requires a basic knowing of general pruning tips. You may look at your plant and think that chopping the whole thing off close to the ground and letting it grow again is the best way. Even landscapers seem to do this, but I don’t recommend it. 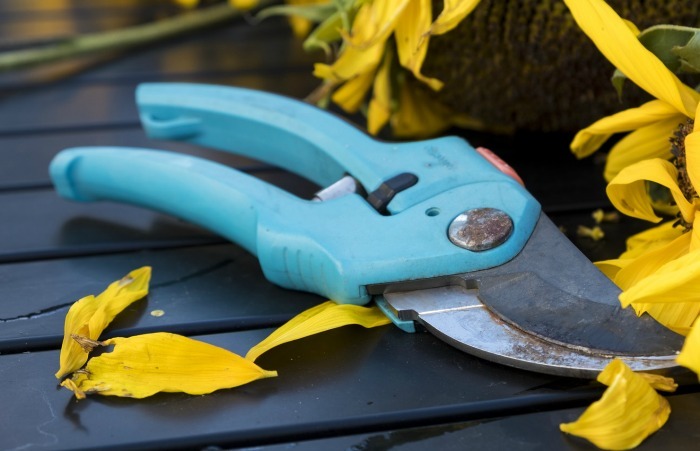 If you have a large unruly forsythia shrub that has been neglected for years, lopping the whole thing back may be your only option, but general forsythia pruning requires a bit more finesse. The tools you will need will depend on the age of your plant. Small immature canes can be removed using bypass pruners. Old forsythia canes can get up to an inch in diameter so will need more rugged tools. A pair of heavy and long branch anvil loppers will make the task of pruning easier. To keep your plants looking good year after year, select a few of the longest and oldest canes and prune them close to the ground level each year. Start this procedure when the plants are young and you’ll always have good looking plants. Careful pruning of some center canes will help the plant to open up a bit as it grows. This also allows sunlight to reach the middle of the plant so that flowers form all over the plant instead of just on the outside tips. All perennials will end up with a few dead branches as the plant grows. Prune out any dead canes and also remove any canes that are growing so close together that they rub against each other. Also look for canes that seem to grow backwards, since this changes the arching shape that you are looking for. I like to examine my plants before the flowering starts in late winter so that I can see what the canes look like without leaves and flowers. It gives me a good idea of the job ahead when it’s time to trim forsythia bushes. If you have any canes that have been trimmed in the past, along the branch but not at ground level, they will have stems sprouting from that point. Remove these canes all the way back so that the plant gets back it’s pretty arching habit. Some forsythia bushes will send out branches that hang too close to the ground, or even grow along the ground. Be sure to remove these. If you don’t, the plants will actually grow roots along the ground. The rooted branches are a handy way to get a few extra plants for free, but is not ideal for the shape you would like, so remove them and plant the rooted branches in another part of the garden. Before long, you’ll have another forsythia bush! Like many perennials, spring is the best time for pruning forsythia. Do this later in the spring after the blooms fade and the leaves are starting to grow. If you wait until summer or fall to trim forsythia bushes, you’ll find that the number of flowers that you get the next spring will be much less than desired. Forsythia flowers bloom on old wood, in the same way that hydrangeas and azaleas do, so spring pruning is best. 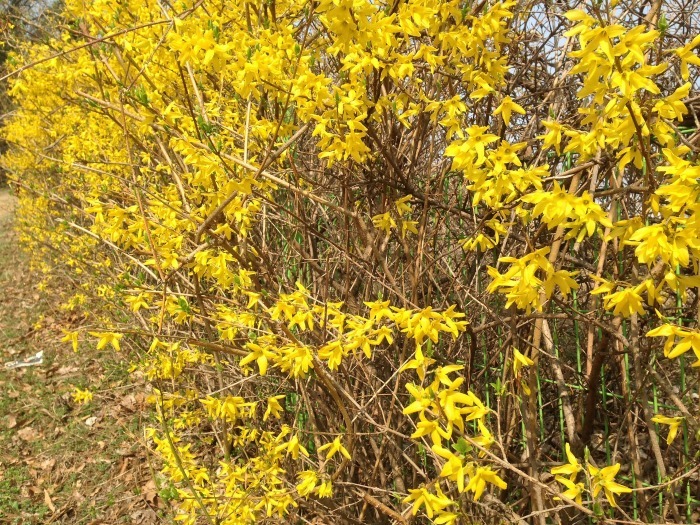 How much should I trim forsythia bushes? Young plants need very little in the way of pruning. Just remove a few of the longest canes and you’ll be fine. But as the plant matures, more of the branches will need to be removed. A mature forsythia plant can have as much as 1/3 of its oldest and thickest branches trimmed off. Should I prune forsythia into a hedge? I have seen this done but don’t recommend it since you will basically you will constantly be clipping off the branch tips, which means far less flowers. Many other shrubs are better suited to hedge style pruning such as boxwood or holly bushes. If you do decide to trim your forsythia into hedges, you’ll need to prune several times a year instead of just once in the spring. Okay, I get it. You’ve let the plant become an overgrown mess that is threatening to take over the garden bed. Thoughts of subtle pruning needs to be thrown out the window my friend. If your plants is in this state, just crop the whole shrub to about 4 or 5 inches off the ground. New shoots will begin to grow. Then, with more careful pruning tips such as those mentioned above, your plant will become a much more manageable shape. It’ll take a couple of years before it is a flowering beauty in spring, though. This type of dramatic pruning is best done in late winter or very early spring while the plant is still dormant. You will lose that year’s blooms but will have the whole growing season to watch how the plant regrows to help with next years pruning session. If winter is giving you the doldrums and you would like a bit of this cheery yellow color inside, try forcing forsythia indoors. It’s very easy to do and can be done when the snow is still on the ground! 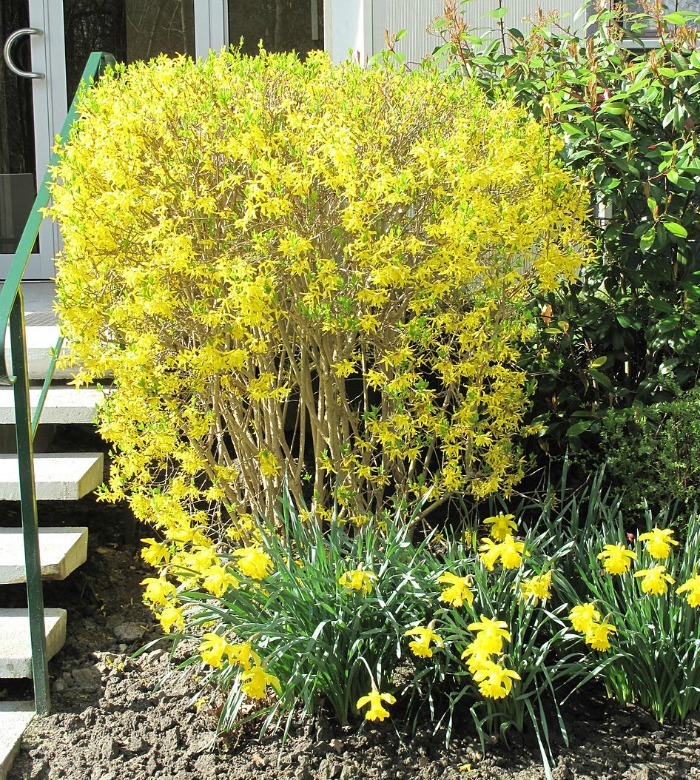 Just take just a few minutes each spring after the flowers of your forsythia perennial have faded to remove your old canes, and you’ll be rewarded with a great shaped plant and those cheery yellow flowers, year after year.